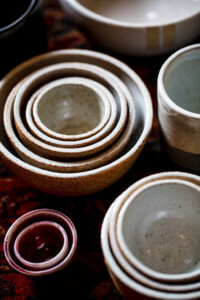 Chelsea loves the tactile nature of pottery – both in the making and the end result. Art that you pick up, touch, hold, use. She first started working with clay in a city recreation and parks class, and has only continued to want to do more. Focusing on functional forms, Chelsea works almost exclusively on the wheel. She’s excited to be a part of the sfclayworks community and eager to learn more about all the many things that make a studio run. On a side note, Chelsea is a “hands up” member at sfclayworks and helps keep sfclayworks running smoothly.